Essence Drain Occultist / Trickster is a well known, solid league starter with countless guides existing! 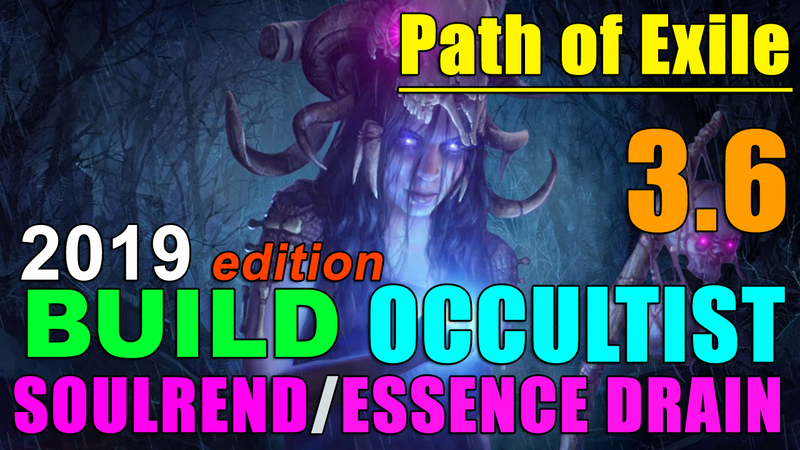 Let's take a DEEPER look into current state of ED and also find out how well new Synthesis gear and skills like Soulrend / Malevolance / Bane will work together! Why "ULTIMATE"? Because it gives you FOUR different setups to play! From offensive to defensive, from poor newbie to rich expert! 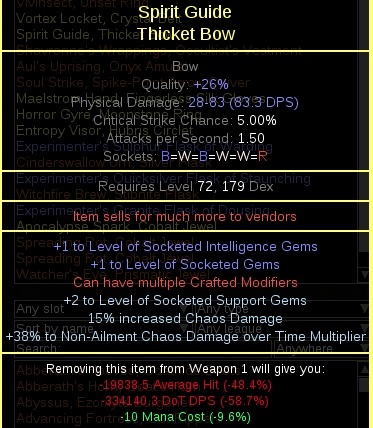 SOULREND vs. ESSENCE DRAIN...who is the winner? Also Talking about using Bane and Malevolence. 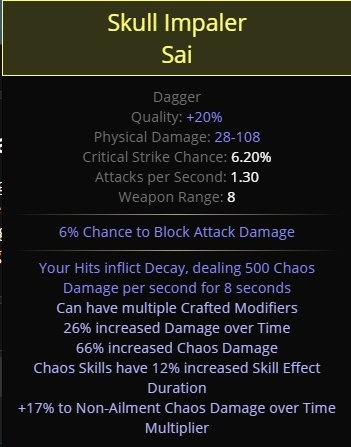 In 3.6 update, a couple of new Chaos Skills appear, such as Soulrend, Malevolence and Bane. As well as older Chaos Skills get significant boost and revamps! We will be using these skills in 3.6 to league start as well as deeper explore different combinations with a well-know Essence Drain + Contagion combo (as Soulrend and ED stacks and count as different sources of DoT). Over last months i've been checking various sources on current Essence Drain situation as well as tried to squeeze max damage out of it. In this guide you will (hopefully) find the most comprehensive and detailed information on different ED setups! Think about Contagion as a "fuse" and ED as a "nuke". You mark enemies with Contagion and then shoot ED projectile in a pack. They start melting and explode, proliferating chaos damage to nearby enemies, thus "chaining" DoT chaos damage. -Not super newbie friendly as you need some knowledge on playing life/hybrid builds and then transition to CI and eventually to Low-Life. For the levelling tree please watch the video guide and check POB! For Ascendancy: Wicked Ward, Vile Bastion, Void Beacon, Withering Presence. 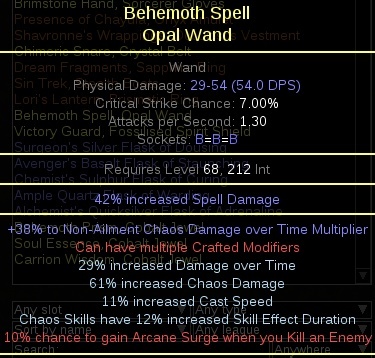 Selling a blue wand/sceptre along with a CHAOS/POISON gem will result in a +1 to Chaos Gems weapon. Use this recipe early on! 1) Blight with Infused Channelling and Void Manipulation till 12. 5) Whatever mix you'll get used to till END GAME. Bane + Soulrend or Bane + ED, or ED + Contagion. Everything is good and depends on your personal preferences! Start levelling Contagion. Take Explosive Trap, Blight or Magma Orb and spell your way forward till Essence Drain at level 12 (after entering Merveil's Caverns in Act 1). You can also use Blight with Infused Channelling and Arcane Surge in a 3L. Add Void Manipulation when its available. I personally used Blight till i got ED. If you want levelling to be faster you can you use Storm Brand (from level 12) or Winter Orb (from level 28) till maps. Bane 4L (if you have 2 curses then switch Controlled Destruction for Enfeeble): Bane-Despair-Enfeeble/Temp.Chains-Void.Manipulation-Conrolled.Destruction. Bane is incredibly powerful on it's own for an early game for trash mobs so you can add any ED/Soulrend gems to it if you have 5L or 6L. Overall it's up to you to decide if you wanna play as LIFE or just go ES from the very beginning. If you can't find / buy ES gear while levelling, then play life and spec into ES when you reach maps. Vertex is my favourite so far. 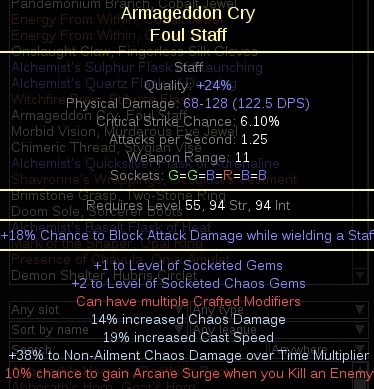 Heretic's Veil can also save you skill slot for Blapshemy and is required for max aura TOP DPS setup. Doedre's Skorn is fantastic for BANE. Belts: Bated Breath, Stygian Wise with Fossil crafted %Chaos Damage, or Crystal Belt. Also https://pathofexile.gamepedia.com/Ascent_From_Flesh is a good starter. For now i am using this on standard league (mostly my hybrid Golemancer gear + 2 legacy rolled rings). This gives me 12k ES. Aegis Aurora is the BEST shield for Occultist, unless you find 2500+ Armour shield with resits. As soon as Synthesis starts i will be updating this section with actual league gear. 1) Play as CI / Hybrid / Life before you get Shavronne's and then you can switch to Low Life. 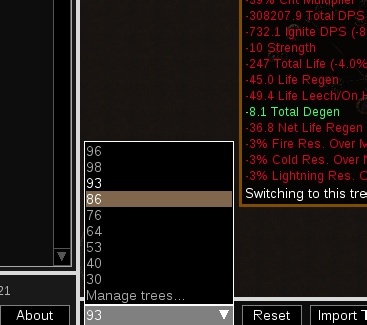 Check levelling trees in the first link for guidance. with Discipline + Discipline Aul's Uprising is not a bad combo-wombo. 5) Energy from Within is usable in multiple places. 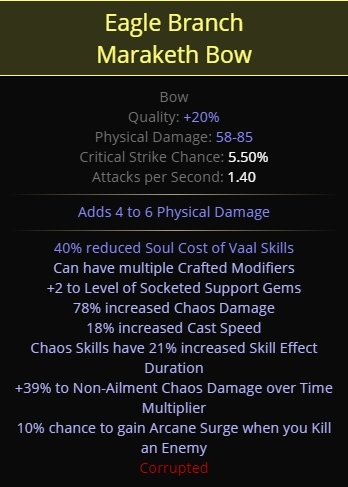 1) Betrayal +3 bow (harder to get now with lower Betrayal encounters) with Soulstrike quiver. DoT damage scales dramatically high with +1 levels. +2 mod can be unlocked from Catarina (Betrayal mastermind). Will take a while to get it!
. Here. You are done. 2) Cerberus Limb + high armour Shield. It's also the tankeist of all! I reached 12k ES with hybrid gear and no Clarity Watchers eye with 2700 Armour Shield. Damage is also enough to do most content (all maps, shaper, etc). 2500 Armour shield will give you 500 ES (and 2500 armour shield is MUCH cheaper than a 500 ES shield)! 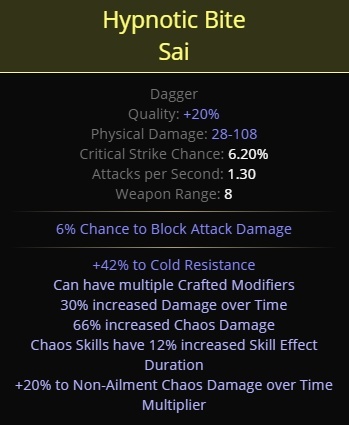 The only problem here is 159 strength requirement, but can be mitigated easily with https://pathofexile.gamepedia.com/Astramentis. 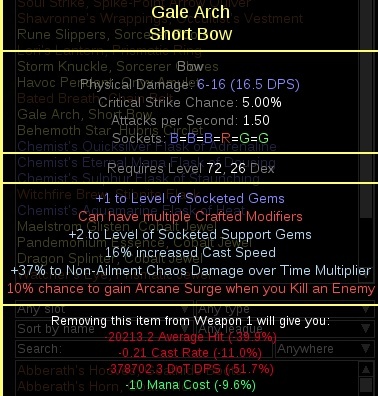 3) Spell Wand / Dagger + generic ES shield. The most generic cookie-cutter way to play. 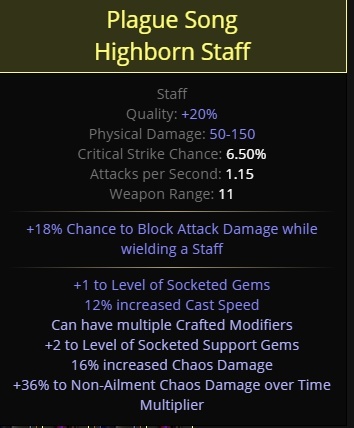 4) 2H Staff with +1 gems and +2 to chaos gems. This is another high DPS setup (as high as +3 bow), but also squishiest / slowest setup as you don't have a shield. Cinderswallow Urn with regeneration is also great! +1 Shavronne, +1 Curse amulet with something useful, like strength and ES. Aspect of the Spider high ES gloves. 1) Can i do it as Trickster? 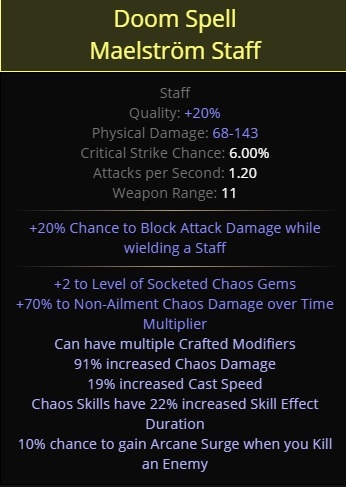 2) What is the best unique shield for the build? 3) How do you feel about SOULREND for bosses? It works just fine till red maps and late end-game. For fast and deadly bosses like Elder/Uber Elder/Atziri/Hydra i strongly recommend Essence Drain. It will give you necessary mobility while doing damage. Why did you post this so early? It's clearly not finished. Gear is not correct at all, like you said. Passive Tree is for... Pathfinder? This "guide" is most likely a copy and paste from an irrelevant build, and is clearly far from finish. It is just a giant plug for your youtube and twitch channels. A link to your Patreon should not be posted on the forums imho. How about a chill pill and give me some time to edit everything from my template. I have 15 builds here. Could at least do the basics on notepad before posting a template that has nothing besides your patreon on it. Checked video. Looks very slow to me. Looking forward to what else you have for this build. I have been thinking of doing a very similar build, and then saw the ES drain in the passive tree, so going to end up changing all of that. But glad to see an experienced player looking at the build, hopefully I can improve my build with what I see. Haha. I was thinking Trickster was faster and did more damage while Occultist was tankier and added more curses.